For the past couple of months, there’s been a storm brewing, deep inside the Apple community. Apple commentators, writers and fans alike have been thinking about the future of Mac. Sparked by the fact that the Mac Pro hasn’t seen an update in 3 years, the Mac Mini’s sad state of affairs, and the new MacBook Pro’s lukewarm response. Some are questioning the existence of the Mac platform years down the line. Some are looking for alternatives. If you’ve come across such articles online, let me give you the other side of the story. The Mac platform (both hardware and software) isn’t going anywhere, at least not any time soon. Touch Bar’s future still hangs in the air, it’s an entire new interaction paradigm. We won’t know if it’s an actually useful feature or a gimmick for at least 2–3 years. It’s been more than a year and 3D Touch is just starting to become useful. But the fact that Apple put in the resources to develop and release the Touch Bar shows us Apple’s commitment to the future of the Mac. It just might not be exactly the way we envisioned it. When you think about it, there’s an entire computer living right above the keyboard. There’s an ARM chip like the one in the Watch, there’s a touchscreen and Touch ID. That’s an amazing technological feat. It’s now up to Apple and third party developers to make it a must-have feature, rather than a gimmick. Ever since Mavericks came out, macOS started on the path of yearly updates. The fact that Apple releases one major version of macOS every year with new features and fixes is a big deal. Funnily enough, this is something Mac enthusiasts don’t exactly want. Mac is our workhorse. Many (myself included) would prefer if Apple took two years updating macOS, making it more stable. 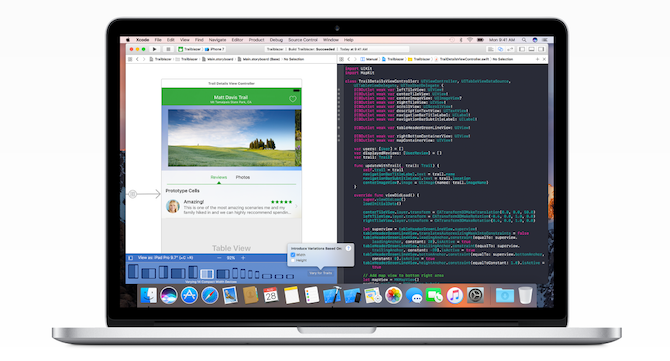 Right now, the Mac is the only way to create apps for iPhone and iPad. Xcode only works on the Mac. Yes, the iPad has Swift Playgrounds but it’s an app created for learning to code, not for creating apps. You could look at Swift Playgrounds on the iPad and extrapolate that it’s not too long until we have Xcode on the iPad. The reality is far more complex. It’s not that the iPad isn’t powerful enough, it’s also the fact that creating an app for iOS takes a lot more than Xcode. It takes online libraries, little tools for automation, not to mention the terminal. And all this needs to run side-by-side or one after the other. This isn’t possible in a closed iOS “one-app-at-a-time” ecosystem. 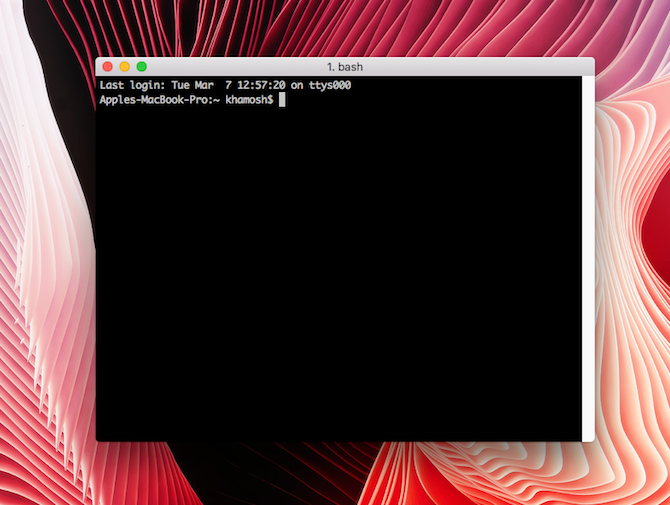 Like Linux, macOS is built on top of Unix. And developers love Unix because of the terminal. It gives them specialized automated tools that help them work better. Starting a new web project or server takes a couple of lines of code. Things like this don’t exist on Windows. If they do, they’re hard to work through. New age languages like Ruby are still difficult to setup and use on Windows. Developers use Macs for the same reason the rest of us do. They get Unix features, along with hardware that’s superior to anything on the PC side which can run Linux. Microsoft is doing a good job of luring digital artists with the Surface Studio and Surface Book, but designers still prefer Macs. 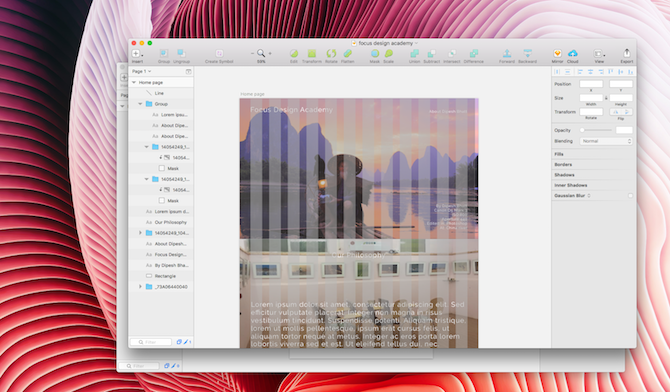 Sketch, which is currently the hottest tool for UI and Graphic design is only available on the Mac. Then there’s Apple’s own set of pro tools: Final Cut Pro, Logic, GarageBand, and so on. In my option, the best tools for working with Markdown also exist only on the Mac. The Mac has always been a machine for creative work. And it’s one of the best systems to get any kind of work done. The app ecosystem is the proof of that. Yes, Windows has more apps but you won’t find the quality of apps anywhere else. The thoughtfulness and polish is what makes Mac apps a pleasure to use. 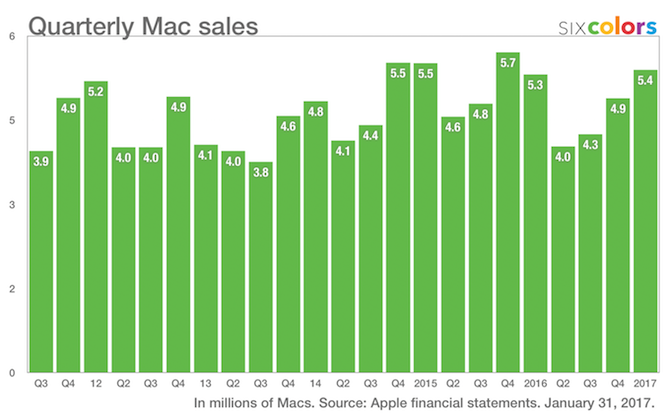 Mac sales have been pretty consistent in the last couple of years. Around five million units per quarter, one after the other. Mac isn’t exactly a declining business. 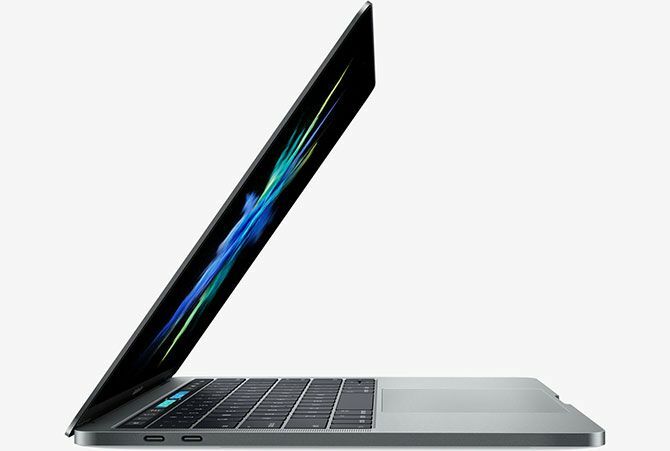 Thanks to the more expensive MacBook Pros, the average selling price is actually going up. 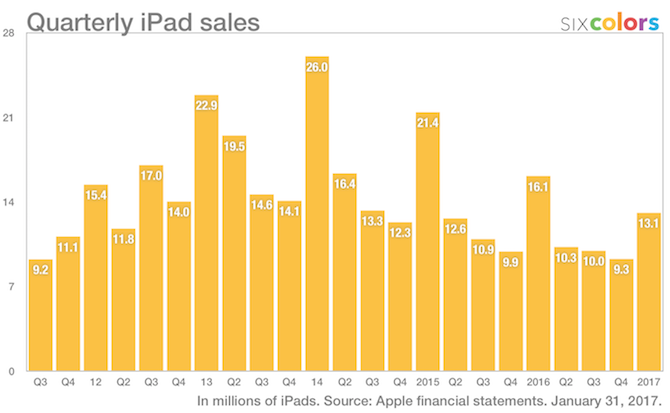 The iPad has been on a steady decline for the last 12 quarters. Going from 18.6 million sales in Q1 2015 to 10.6 million sales in Q1 2017. That’s quite a drop. Of course, the iPad still sells twice as many units, but not all iPads are used for getting work done. The conventional wisdom is that the iPad will replace the Mac. While some users can replace their Mac with a tablet, it’s not for everyone. The iPad can be a great productivity machine. If all you do email, communication, writing and basic Office stuff, there’s no doubt you can do all it on the iPad. But as soon as you introduce even a bit of complexity, things fall apart. Writing an article on the iPad is easy. But using tools to edit it, add images, links, uploading it to WordPress is almost a nightmare. I tried it and I gave it up in a week. The same goes for coding, designing, image editing, audio ending and so on. Where is all that desire and need to replace the Mac with an iPad coming from. Everything on the Mac is better. Except drawing pictures. A lot of this is because of the way iOS is designed. Apps can’t talk to each other, there’s no way for two apps to take over one single file, there’s no official automation support. The other thing is the lack of apps. There’s no proper Photoshop or Illustrator on the iPad. There’s no feature rich code editor or IDE on the iPad (though from what I hear, Coda 2 is pretty good). There’s no incentive for developers to pour millions of dollars in developing an iPad app. Some can’t exist on iOS because of platform limitations. The iOS ethos hasn’t changed in the past decade, and I don’t see Apple making any drastic changes now either. It’s not their style. Now that I’ve laid out my argument for why I don’t think the Mac is going anywhere anytime soon, let me try and tear it apart. Last quarter, Apple sold 5.4 million Mac units and earned $7.2 billion in revenue. Those are huge numbers sure, but they’re nothing compared to the iPhone: 78.2 million units and $34.9 billion in revenue. Apple is the iPhone company. As the iPad runs iOS and the same hardware, it benefits from Apple’s breakthroughs in iPhone hardware and software. It’s possible that at some point in the future, Apple will stop caring about the Macs. Maybe the numbers won’t make sense to Tim Cook. The Mac has been the preferred workstation by creatives, professionals and a subset of developers. I truly believe that for a majority of those users, there’s no other “great” option in the market right now. But what if Apple decides that it’s not the market they want to cater to anymore? We’ve seen glimpses of this with the new MacBooks already, which let go of higher performance and high capacity RAM in exchange for sleekness. Then there’s the Mac Pro which hasn’t seen an update in three years. The Mac mini’s last update was two years back, and they actually made it worse. I like to think that there are enough people inside Apple rooting for the Mac. And there’s enough people out here who cherish the Mac. Whose livelihood depends on it. And I hope Apple continues to cater to that market. 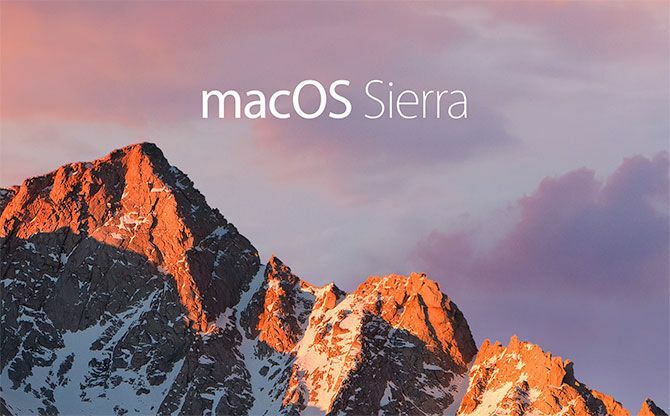 What do you think about the current state of Mac hardware and software? Where do you think the puck is going? Share with us in the comments below.